This walk: 2018-5-25. Pork Hill car park, Cox Tor, Barn Hill, cist, Windy Post, bench mark(? ), Grimstone & Sortridge Leat, double bullseye stone, Feather Tor, leat crossing places, tongue & groove stone, Pew Tor, dew pond, stone workers' boundary markers (1847 & 1896 versions), SS/P Sampford Spiney Parish boundary pillars, Heckwood Tor, Heckwood Tor Quarry, Plymouth Breakwater blocks, Little Staple Tor, Middle Staple Tor, Great Staple Tor, Vixen Tor, Great Mis Tor, Blacksmith's Shop, Wheelwright's Stone, clapper bridge, leat aqueduct over Beckamoor Brook, car park view display. . Looking back at Pork Hill car park across the old Moortown leat, with the backdrop of Cox Tor (SX 530 761, elevation 442 metres /1450 feet). Barn Hill cist with Windy Post, also known as Beckamoor Cross, in the distance - in the centre of the photograph down from the top edge. Grimstone and Sortridge Leat running from Grimstone Head Weir at SX55287729 to Sortridge Farm at SX50857109, a distance of over 9.0 kilometres. The leat splits at the Bulleye Stone (SX53447428), heading south past Pew Tor. Also splits at SX53327426, heading west towards Moortown. The leat served the medieval manor houses of Grimstone and Sortridge. Windypost Cross, also known as Beckamoor Cross, beside the Grimstone & Sortridge Leat that was built to supply those two manors near Horrabridge. It is one of the wayside crosses along the Abbots' Way connecting Buckfast with Buckland and Tavistock Abbeys. Source: F.H. (Harry) Starkey (1989) Dartmoor Crosses and Some Ancient Tracks, pages 27-28, although he says the precise route is uncertain. Eric Hemery (1986), Walking Dartmoor's Ancient Tracks, Robert Hale, London, pages 74-78, shows Windypost Cross as being beside the Jobbers Road (Tavistock Branch) that ran from Tavistock to Princetown where it linked up with the track to Buckfastleigh. This was important in the wool trade in the 1200's/1300's. Windypost Cross was also passed by the Tavistock-Ashburton track that was marked by the erecting of the TA stones in 1669 (Hemery, pages 109-111). Probably several tracks passed this way and then wended off to different destinations. Showing the location of the drill testing stone with respect to Windy Post - 48 metres south-west. Closer view of the notice by the leat - this is the only water supply to several farms and dwellings. Gerrard, S., 1990-2002, Monument Protection Programme. Archaeological Item Dataset., MPP 130913, 1993(Report - Survey). SDV277946. Wayside cross known as Windypost, Windystone or Beckamoor Cross. Situated immediately next to a long established track leading from the moor around Merrivale into Tavistock. Cross lies on level ground between Barn Hill and Feather Tor and is visible for long distances from the west and east. The monument includes a granite cross with a Latin head and a straight octagonal shaft inserted into a platform composed of several stones, one of which is part of a broken socket stone. Cross leans slightly to the west, stands 2.0 metres high and its arms measure 0.7 metres wide and these are also chamfered to produce an octagonal section. An Ordnance Survey bench mark is cut into the lower part of the cross-shaft on the south-facing side. John Robins (1905-11th April 1992, age 86) wrote that, according to Mr. Hearn of Oakley Cottage, Pu Tor, his grandfather, John Henry Hearn, helped to dig the leat channel to the west of Pu Tor, this being the present course of the Grimstone & Sortridge leat, to supply the farms in that area. This was sometime around 1873-1880 - although this appears a little confusing. The statement "Now we come to the year ..... ", starting a new paragraph, could apply to the previous paragraph and the cutting of a leat designated "Longford Leat" by Eric Hemery (High Dartmoor, page 1024) - this leat crosses the G&S leat, probably by an aqueduct, and runs to a takeoff from the river Walkham about half a mile above the G&S leat headweir. This leat might have been more properly referred to as Wheal Fortune Leat because it went to that mine at Merrivale. Another old leat can be traced from Beckamoor Brook to Longford, a farm at the bottom of Pork Hill. 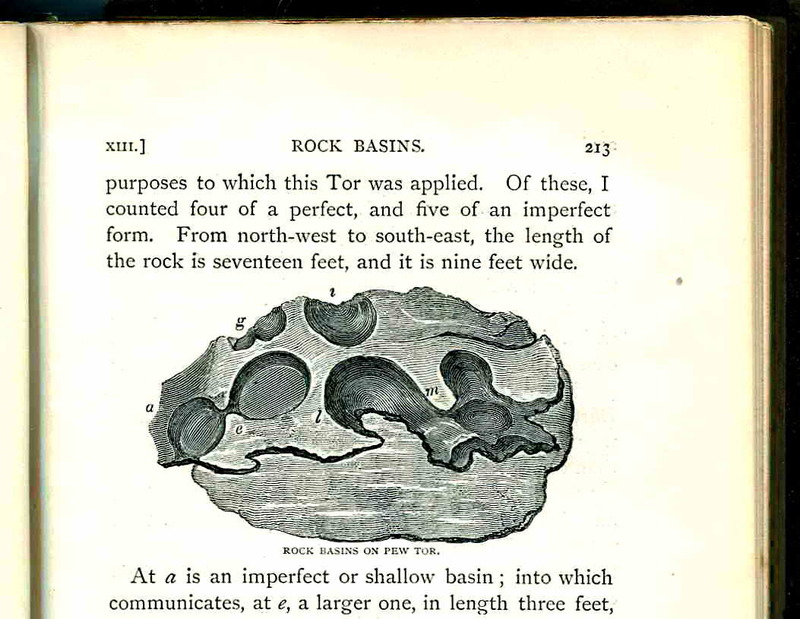 The story from Mr Hearn was that the original bull's eye stone, always known by Mr Hearn as "inch holes" was cut in error using a 1-inch jumper, resulting in a 1�-inch (1.25-inch) hole that was "against regulations". The hole was plugged and a new one cut using a �-inch (0.75-inch) jumper. The plugged hole can still be seen. While researching this walk, I found a letter to a newspaper from John Robins tucked into a second-hand book - this clarifies that the Grimstone & Sortridge leat from the bullseye stone was dug sometime between 1873 and 1880; the original leat to these medieval manors is said to be much older. Source: John Robins (1988), Rambling On with John Robins, John Pegg Publishing, London, page 61. "Thar she blows .... or not!" After a fourth recon visit and using a churn brush to clean off some of the algal growth, the blocked 1�-inch (1.25-inch) hole became apparent, both to see and touch (there is a slight recess). If that is the original cement material from 1873-1880, then it has lasted exceedingly well. Clapper bridge located at SX 53490 74343, 60 metres north east of Windy Post. Closer view of the edge of the stone, showing wedge and groove marks. At SX 53476 74072, a possibly unfinished cider press basal pound stone or a millstone, the rim and the central boss are defined. This would need a lot more work to deepen the trough around the central boss where an edge runner stone would be drawn around by a horse to crush the apples ..... although it seems a little small for the job - therefore it might well be a millstone or something else entirely? Showing the cider press / millstone in relation to the tor. The near-circular stone (seen above) is located just left of the deep shadow seen towards the top left corner of this photograph. A simple step-over crossing place nearby at SX 53430 74099 - to the right when looking at Pew Tor. Looking back at Feather Tor after crossing this branch of the Grimstone & Sortridge Leat. The split grooves are clearly seen in this photograph, this looks very different to when the newer feathers and tares method is used, leaving split drill holes in the rock. The new feathers and tares methods was introduced around 1800. More detail about splitting granite - there is a link to a video of granite splitting at Burrator in July 2014 - click HERE to see a 160MB, 17-minute video of the process. The split comes at 16:37 minutes if you want to run it on! 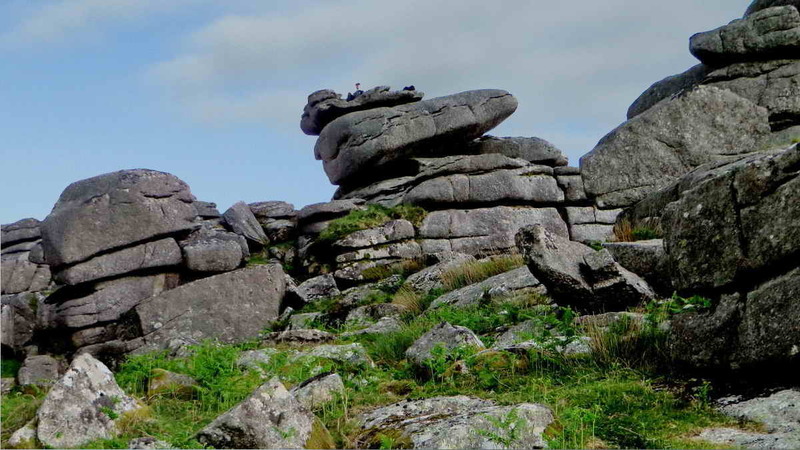 There is a photo HERE of a Dartmoor rock split with granite wedges where two are still in place (click on the 6th photo from the bottom). Wedge & groove - ancient rock cutting in southern India - Youtube video. Zoomed view to the dew pond. Kent & Co, Paternoster Row, London. Vol 1, pages 211 & 213. I believe the lip in the photograph above is the feature labelled "i" in the figure above. 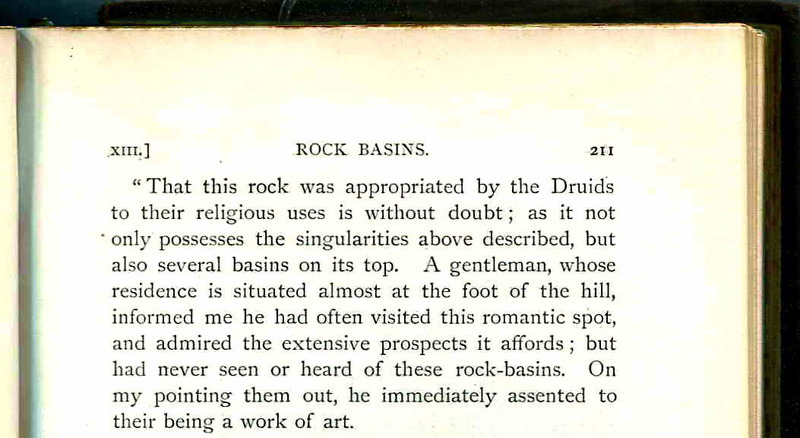 I do not believe these rock basins are examples of Druidical art. Bray Mrs (Anna Eliza Bray or Mrs A. Eliza Bray) (1879), The Borders of the Tamar and Tavy, 2nd edn, Vols 1 & 2, Kent & Co, Paternoster Row, London. The book was written as letters (each forms a chapter, 38 in total, in 2 vols) to Robert Southey, Lakes poet (1774-1843). Mrs Bray lived 1790-1883. First published 1836, in 3 volumes, entitled: A description of the part of Devonshire bordering on the Tamar and the Tavy. She compressed the work herself, leaving out material she considered of no value to the then-current reader. Much of the book is material copied from her husband, Mr. Bray's, Journals - Reverend Edward Atkyns Bray (1778-1857). 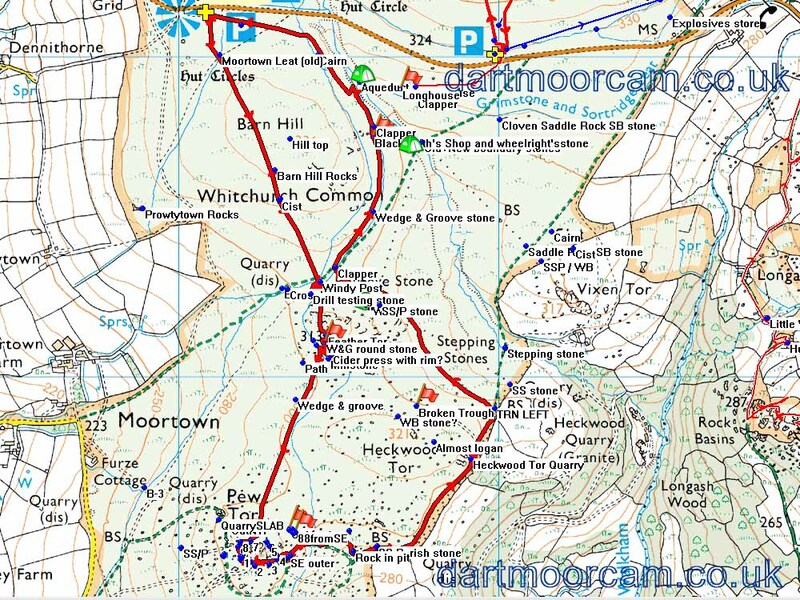 On the south side of the tor there are two WW2 bomb craters close together - Pew Tor is said to be the only tor on Dartmoor to have been bombed; the GPS locations are at SX 53195 73440 and SX 53226 73423. The bombs came from the north, missed the tor and gounged into the ground, 35 metres (about 40 feet) apart, each throwing up a ring of soil, as seen above. Closer view of the parish boundary marker. Pew Tor seen from a little way down the slope to the south. The rest of us just waited below, having coffee, - 18 of us in tottal. Closer view of the newer, 1896, marker. The following notes are culled from previous walks and unphotographed research walks: 8th April 2010 (includes new-found marker), 28 December 2011, 8 Feb 2012 (concentrating on the 1896 outer markers), 17 March 2016.
" ...... These are even smaller than the 1847 ones, only six inches in diameter and difficult to find, in fact one still eludes the most diligent searches for it. When Helen Harris wrote her article (Nineteenth Century Granite Working on Pew Tor and Staple Tor, Western Dartmoor, T.D.A. 1981) only two of the four marked stones had been recorded, but since that time the one at the north-west corner of the protective limit has been found. This stone is marked with the symbol both on its horizontal and vertical faces, and is near to the small quarry. The author did hear that the one at the south east corner was found in the early nineties, but no confirmation was forthcoming". "On 30 December, 1896 it was reported that �Mr Duke has had marks cut in some natural fixed stones to indicate new protective limits of Pew Tor, each mark being a circle with five holes about an inch deep to distinguish them from the original marks made by a cross within a circle'105 (see Fig. 3). Of the four marks, which are slightly smaller (roughly 6 inches in diameter) and less conspicuous than those of 1847, the ones on the south-west (see Plate I lib) and south-east corners have been found, but the other two are so far not located. Possibly they are obscured by encroachment of grass growth or lichen." This definitely states that the south-west and south-east markers are recorded. With the north-west marker being found near the small quarry, it is the north-east marker that is missing. It is unlikely to have been removed and is therefore probably overgrown, as was the south-east one, almost totally covered with grass except for one drilled hole. I and others spent a lot of time searching for the markers in 2010, finding all except the north-east one, which, after calculation from the original 1896 sketch map in Dave Brewer's book, should lay somewhere around SX 53345 73527.
with their GPS locations, missing their prefix "SX". 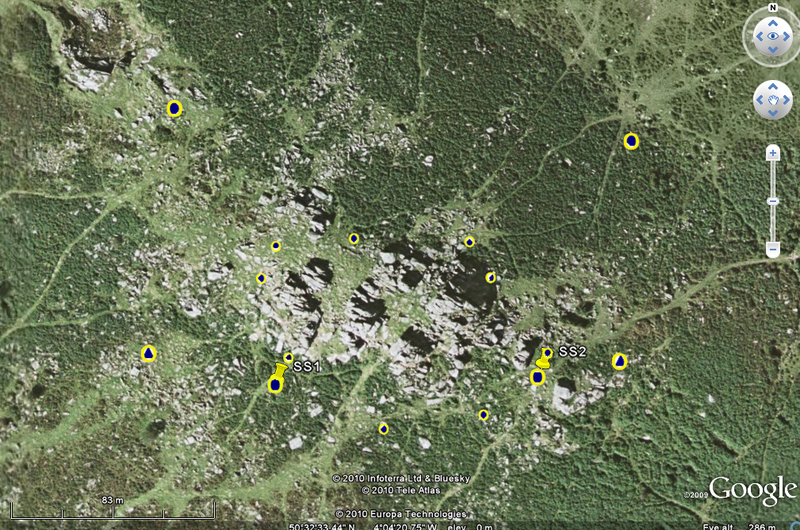 Google Earth image, copyright Google Earth 2010, with overlain boundary marks from the Excel chart. The two "map pins" show the Sampford Spiney boundary stones. There is a mismatch wi the symbols - the outer symbols - the two at the top (black circles) and the two at the bottom (black triangles) - are the later, outer, 1896 markers. The north-west and south-west markers have been known for many years. The south-east marker was "lost" a long time ago and was found by Keith Ryan in April 2010. The north-east marker remains "lost". There are actually four of the markers known, the north-west location has TWO markers, one on a flat surface and one on a vertical surface, a few inches apart. There is a story that the man cutting them cut three and then had lunch. After waking from the effects of his cider he thought he should get the fourth marker cut and then went home. The numbering above is arbitrary, purely to assist identification of markers when walking around the tor. North-west outer SX 53158 73539 (2010) South-west outer SX 53144 73447 (2010) North-east outer - "lost"
The new-found (i.e. in 2010) south-east marker is at centre-bottom of the photograph, showing how close it is to the tor. Crossing the leat again, east of the tor, running to Downfield Cottages and beyond. There are two cross ditches inside the oblong, like foundations for a building. At first I thought this might be a new blacksmith's setup, to service the tools of the stone workers, but there is no ready water supply - although the branch of the leat is not far away. Another possibility might be a planned workshop for the stone workers. This would be similar to the workshops at Tor Quarry (Merrivale) after it was opened in 1876 by Mr Duke. This could relate to the marks made around Pew Tor in 1847, when stone cutting was at its height - the marks were extended in 1896. A large piece of granite possibly being dug out of the ground, at SX 53545 73453. The top piece has already been cut off, using feathers and tares. This is near the bottom of the path from Pew Tor down to the larger track to Heckwood Tor Quarry. A little further down from the tor, approaching the track to Heckwood Tor Quarry. SS / P stone beside the track, SX 53619 73468. Google Earth image showing blocks in position on Plymouth Breakwater. Copyright Google Earth 2015. It is probable that the granite blocks were used in building the breakwater, the blocks seen above are said to be later, larger concrete additions ..... the granite blocks may be the items giving rise to the "serrated" appearance of the side of the Breakwater towards the bottom of the page i.e. the seaward side. A part of Heckwood Tor - there are several outcrops on the hill. View from the track after leaving the quarry and heading northwards, with - extreme left, Little Staple Tor, just below the skyline - Middle Staple Tor and the steeples and mass of Great Staple Tor (right). Vixen Tor, which stands on private land. ..... and when the bull has finished work, it is said he is "dun roamin". Another view, with the Walkham Valley (left). At the back of Feather Tor, a Sampford Spiney Parish boundary stone - SX 53629 74224; with WB for Whitchurch Bounds on the reverse. There is another bound mark with "W" (Whitchurch) cut on the top of a large rounded rock in the area - "10 yards south" but I didn't find it. These are described by Dave Brewer (2002) Dartmoor Boundary Markers, Halsgrove, pp. 167-169, on page 168. A wedge & groove cut stone in the path en route to the Blacksmith's Shop, at SX 53608 74518. Site of the ruined blacksmith's shop beside the Grimstone & Sortridge Leat, with Beckamoor Coombe in the background, streamworked by early tinners. The solid granite former for wheelwright work is seen left of centre in the photograph and a clapper bridge over the leat is seen at the left edge. Image reproduced from the first link below by kind permission of Dartmoor Archive. 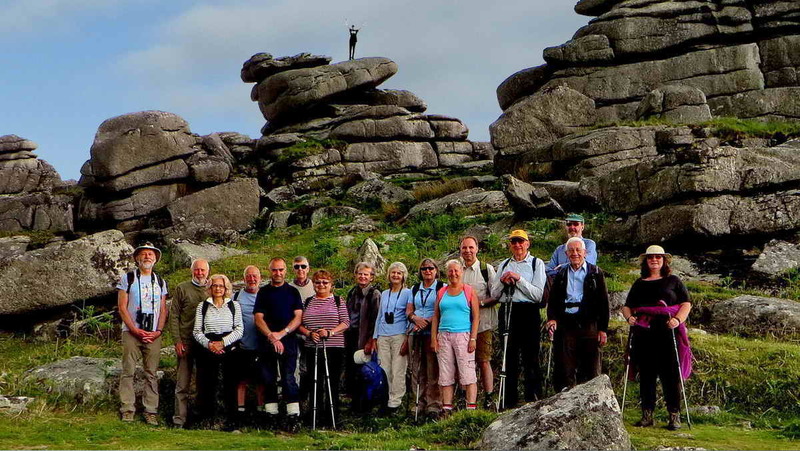 See the Dartmoor Archive image online HERE. "The roofless shell of Blacksmiths Shop otherwise known as Mine House on Barn Hill, with Vixen Tor and King Tor behind, photographed in 1953. 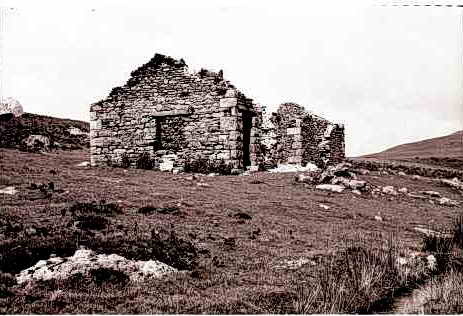 This well-known landmark, probably built in 1871 as a smithy to serve stonecutters in the area, was demolished in June 1964 by Blundells School Army Cadet Force with with the authorisati0on of the dartmoor National Park Committee." Building plotted on the 1888-1913 25-inch OS map - on the 1884 single sheet map, the leat ran on the higher side of the slope from the building. Dartmoor Archive - Ruins of a house on Barn Hill - "This seems to be the site of the blacksmith's house and forge, destroyed in the 1950s or 1960s by the gentlemen of Blundell's school, apparently given permission to blow up the building." 07/08/1939. 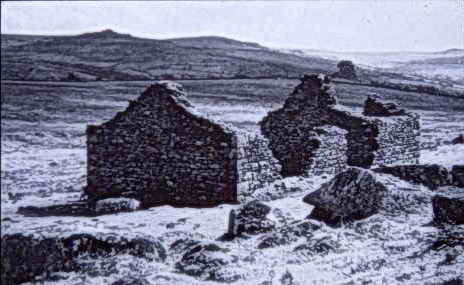 A ruined building on Barn Hill, by the Grimstone and Sortridge Leat, near Merrivale. Dartmoor Archive - Barn Hill - "Taken in April 1953 of the ruins of an old house, perhaps a blacksmith's shop. The house stands by the Grimstone and Sortridge Leat and has a wheelwright's stone lying in front of it. Vixen Tor is visible in the background." Harris, H., 1981, 19th Century granite working on Pew Tor and Staple Tor, Western Dartmoor, 42-43 plate (Article in Serial). SDV236242. Ruined smithy on the sett which includes Pew Tor and Staples Tor. Erected in 1860s to serve the needs of stonecutters and their horses working the granite on the sett. A large circular stone beside the ruins was used for making cartwheel bands. The wheelwright's stone - the wheelwright and the blacksmith would have been the same person. Their work would have been the sharpening of tools and maintenance of carts and wagons as well as shoeing horses for the quarries at Pew, Heckwood, the Staple Tors as well as the sett makers in the area. The depression in the centre of the stone was for accommodating the protruding hub found on wagon wheels. Former wheel-binding stone used by a wheelwright to fit an iron tyre around the outside rim of a wooden wheel. Stone is located adjecnt to the Grimstone and Sortridge Leat, near the remains of a 19th century blacksmith's workshop. The building is now in a state of total ruin, merely a pile of rubble, but a large wheelwright�s stone still remains on the leat bank. The shop looked after the needs of the sett-makers and other stone-cutters who worked on the Steeple, Roos and Pew Tor setts, and was built by John Greenwood, then lessee of the stone-working and quarrying setts, in the early 1870s � although he might in fact have rebuilt or renovated an earlier building on the site (see below). The blacksmith, whose name is not recorded, sharpened the workers� tools, attended to the shoeing of the horses used for hauling the granite-laden wagons down to the railhead at Tavistock, and his large wheelwright�s stone � presumably cut at or near the site � was used for sealing iron tyres onto the wooden wagon wheels. As noted above, Greenwood might have rebuilt a much earlier building which formerly stood at the spot, a suggestion mooted by Harris in her TDA 1981 report on the granite operations in this vicinity. This was merely conjecture at the time the paper was written, but supporting evidence for a building having stood here before the 1870s was recently discovered by myself, in a rather unusual source. For it may well have been the building in which John Bickle sought refuge in 1858, on the run from the police after having attempted to murder Joanna Bolt at the Huckworthy Bridge school house (q.v. grid square 5370). For he was reported to have been caught and arrested at �an unoccupied house on Barn Hill�. As far as I am aware, there has never been any true �house� in the immediate vicinity � and all the farmhouses on the edge of Whitchurch Common were certainly occupied at the time � so an abandoned cottage and workshop standing on the site of the later smithy would seem to be the only structure which could fit such a description. The wheelwright's stone with the clapper bridge behind. The stone was used to hold a wooden wagon wheel while a red hot iron tyre was fitted over the rim with precision to hold, contract and compress the structure of the wheel tightly together. The hot tyre would have been cooled by quenching with water, probably in the adjacent leat. Clapper bridgr with the depression of the tin streamworks in Beckamoor Combe behind. An extensive and well-defined streamworks located between Cox Tor and Little Staple Tor. It extends southwards from SX5353 7570, but was not investigated south of SX5350 7500. It consists of a broad cutting, up to 4.5 metres deep, with near vertical sides. Within the cutting a complex of well-defined parallel water channels and spoil heaps represent the remains of extensive tin streamworking activity. Streaming appears to have continued here until at least 1860. There is a lot of information in this link but the streamwork was investigated from just north of the smithy and extending further northwards. A view of the leat / stream cross-over (August 2016). John Wills 1953-1987, carved into one wooden side (August 2016). A time when it was really raining in November 2010, think yourselves lucky! Visitors' viewpoint at the end of Pork Hill car park ..... erected in 1984, according to Mike Brown who thanks Simon Dell and others in his CD Guide to Dartmoor. The installation above is an artistic interpretation of the view from this vantage point. The various objects seen are identified along the top of the plaque where the wording is rotated left 90� and linked by vertical dotted lines to the distant object, as listed below. See Legendary dartmoor - Pork Hill for a good description of this area. Click on the image to see a larger version. This plaque is on the reverse of the installation ...... ("Merryvale" is as it appears in the inscription). DUCHY OF CORNWALL AND THE WHITCHURCH COMMONERS. BASE STONE AND PAVING FROM MERRYVALE QUARRY, DONATED BY TARMAC QUARRY PRODUCTS. SCULPTOR: BRIAN ROTHNIE (ACCES), BRISTOL. This walk was reached by parking at Pork Hill car park at the top of Pork Hill, on the right when driving from Tavistock, on the left when driving from Two Bridges/Princetown. It is signified by the P symbol and the yellow cross on the map.